I’m not sure how I went this long in life without never making refrigerator pickles before! I’d assumed that making pickles required special canning equipment and would take months before they’d even be ready to eat. Wrong! Refrigerator pickles couldn’t be any easier. 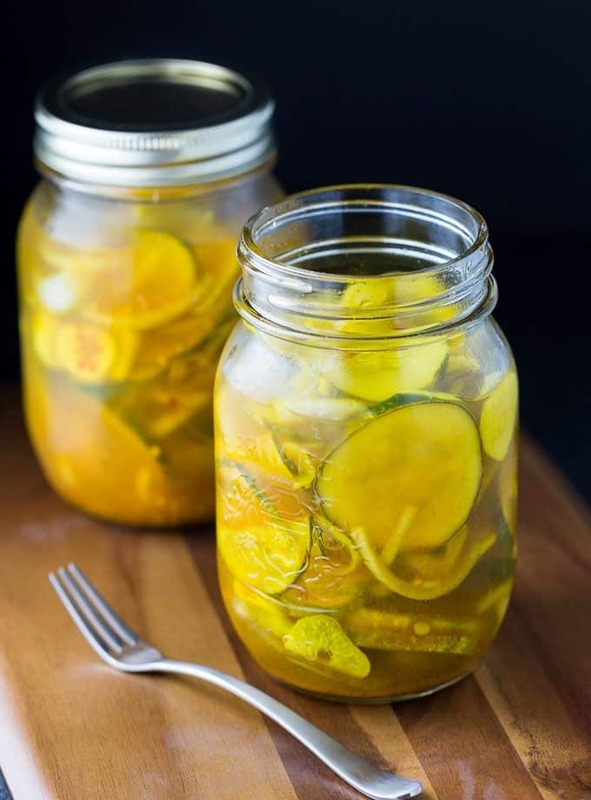 You only need a few basic ingredients like cucumbers, obviously, vinegar, spices, sugar and a mason jar. Oh and a fridge – can’t forget that too! They are ready to enjoy in a mere four days. My Grandma June made the absolute best pickles and I’m pretty sure they were refrigerator pickles. I remember eating them with a fork out of jar while standing in front of the fridge. Sadly, she passed away without leaving the recipe behind. I wish I had it because I’m still craving her pickles to this day. In my recent Craftsy course, Love Your Vegetables, our instructor showed us how to make these amazing refrigerator pickles. I saw a basket of fresh cucumbers at the grocery store for $3.99 and figured I’d give them a shot. I ended up making two kinds: bread and butter and just plain ol’ pickles. I couldn’t believe how easy they were to make. And the taste! Oh the taste. So so good. These Refrigerator Bread & Butter Pickles have a spicy kick to them. My cousin, Allie, tried them and remarked that they had “bite”. I like that they are a bit on the spicy side. The other pickles are more tame and won’t leave you running for a glass of water. I used pickling spice I picked up at Bulk Barn. They are super simple to make too. Next time I make them, I’m adding in fresh dill. Our store was out so I couldn’t add it in, but they still tasted yummy. Out of the two varieties, my faves are the Bread & Butter pickles. They are addicting! The two jars I made lasted about a week in my house. Everyone enjoyed them. 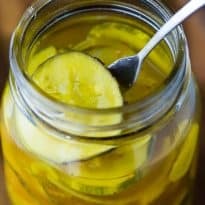 Have you ever made refrigerator pickles? I’d love to hear what’s in your recipe. 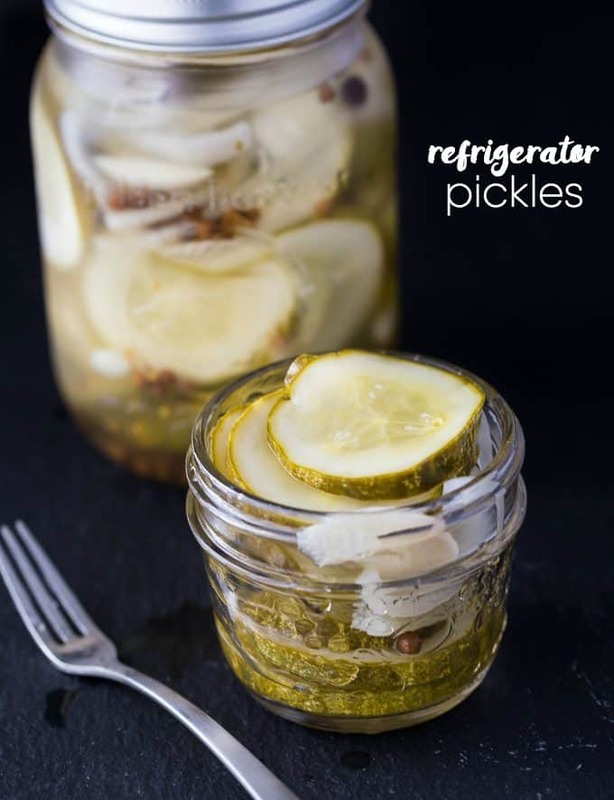 Making pickles couldn’t be any easier! They taste delicious and ready to enjoy in just four days. No special equipment required. 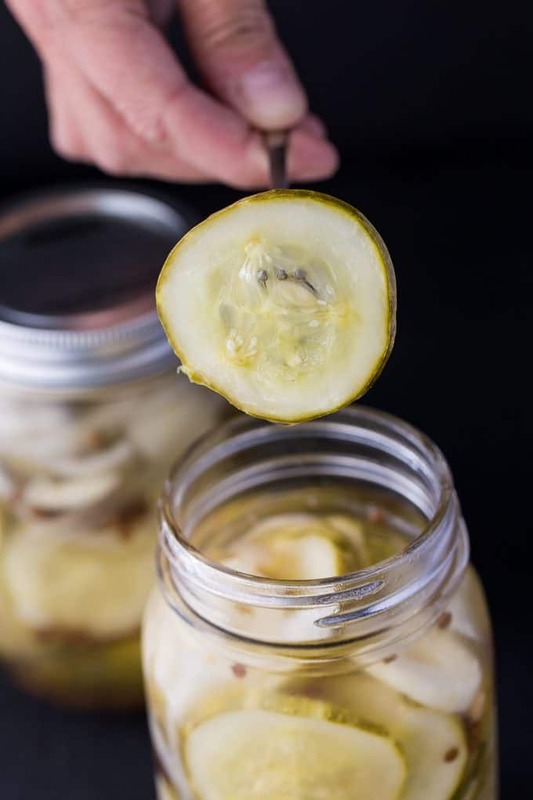 Divide sliced cucumbers into two mason jars and top with sliced onion. Bring vinegar and the rest of the ingredients to a boil in a pot on the stove. Boil for 1 minute and remove from heat. Pour vinegar mixture into each mason jar, evenly. Let cool with the lid off until it reaches room temperature. Place the lids on the mason jar and refrigerate for four days before enjoying. Store in the fridge up to one month. 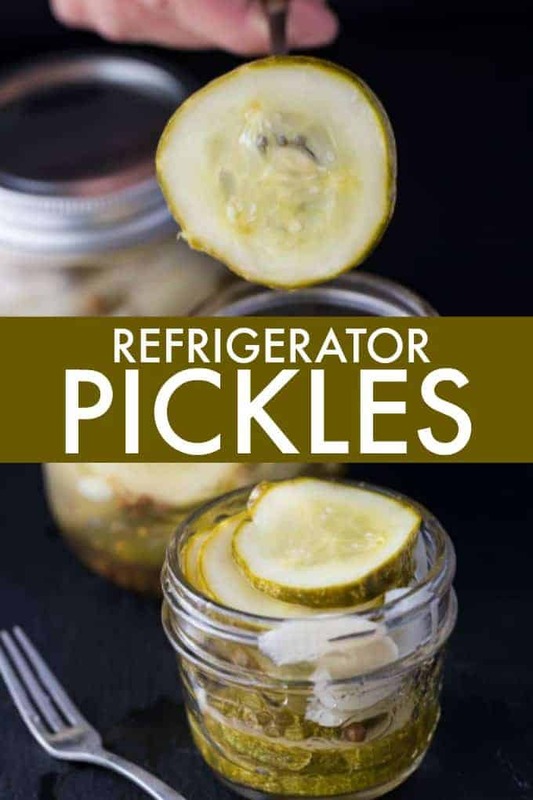 I love pickles and these refrigerator pickles look so good to put on hamburgers or to just eat out of the jar. I bet they taste good. I would love to make these for my family. My mom used to make bread and butter pickles but I’m not sure we still have the recipe…thanks for sharing yours! 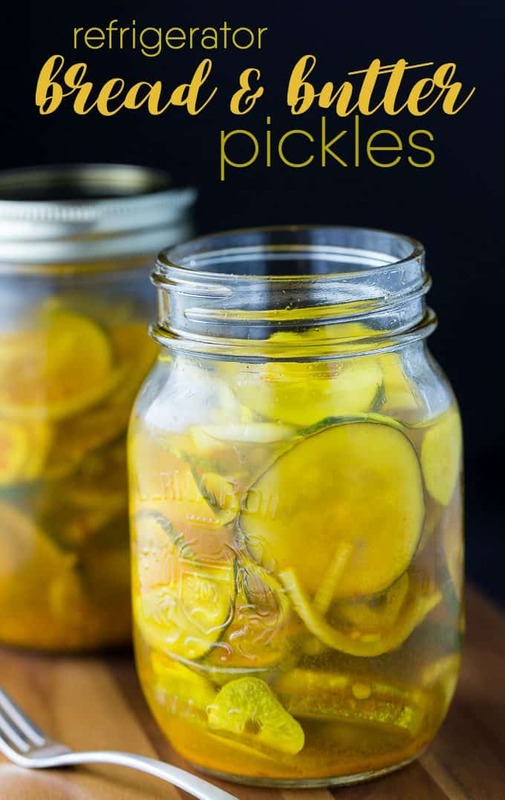 Love pickles but have never made refrigerator ones, will have to try this recipe out. I’ve never had homemade pickles before, but these look a lot better than the store bought kind. They look a lot crunchier. I have cucumbers from our garden I’ve been wondering what to do with. Now I know – thanks! the best. 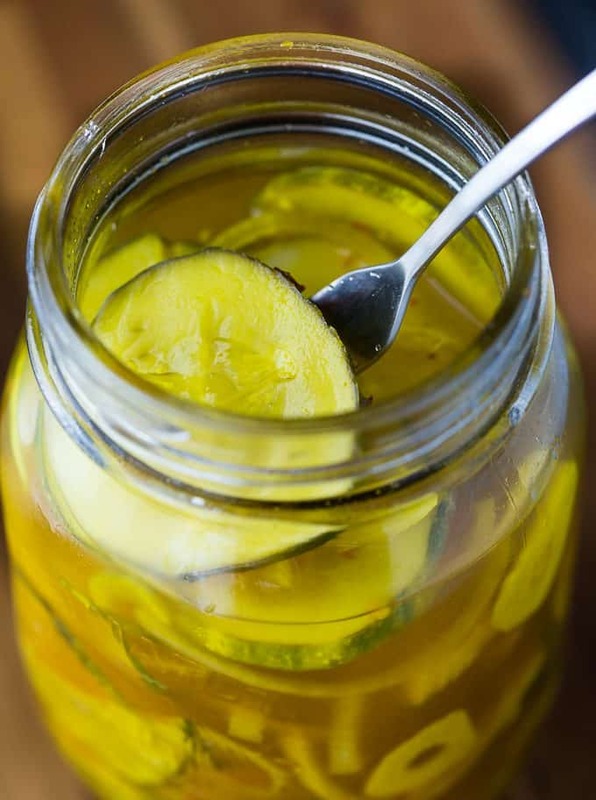 You won’t buy anymore pickles in the store after your first batch. a new one to try! tis the season! I have two jars made in my fridge. We have a garden and I still have a few cucumbers to try this recipe on. Can’t wait to see how they turn out. I love bread and butter pickles but I think I will just make the regular refrigerator ones this time. Both recipes sound real good so I will be sure to pin them for later use. These are so good. I added a couple of sliced jalapeno peppers to spice it up a bit, and it was delicious. I will make these all the time. Great on sandwiches and hamburgers.